The Sunbank is known as an ‘integrated pressurized’ or ‘compact pressurized’ solar water heater. And it is the only solar water heater of this type that is SRCC certified and qualifies for the federal tax credit. The advantage of this type of system is that it eliminates pumps and glycol, and reduces the complexity and cost of the system. This is a popular type of water heater internationally, but in the US the active or split technology was first popular in the 1970s. You can find a similar system on the market, but oftentimes they come directly from China, mis-state their certifications, and do not offer a warranty that they will back up. There are also two other types of solar water heaters that look the same on the outside, but are in fact two very different technologies. 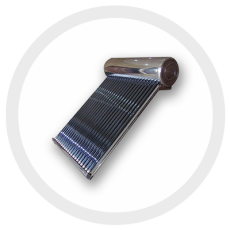 Popular in tropical, developing countries, the non-pressurized solar water heater looks the same in that it has a tank and evacuated tube collectors but in fact has a very different working principle. The non-pressurized solar water heater’s tank is not built to withstand municipal or well pressure and the evacuated tubes instead of having heat pipes are actually filled with the same water from the tank. This water is directly heated in the tubes and the hot water rises into the tank. Instead of being a closed system with a temperature and pressure valve (T/P valve), this system has a vent and is open to the elements. This system must sit above the point of use as it uses gravity to deliver the hot water. A gravity feed does not deliver strong water pressure. To fill the water heater, you must either manually turn the water on or have an assistant tank that keeps it topped up. 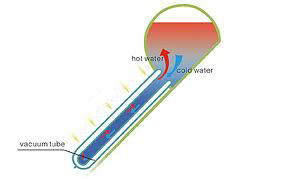 Because there is potable water in the evacuated tubes, this system cannot handle freezing weather. 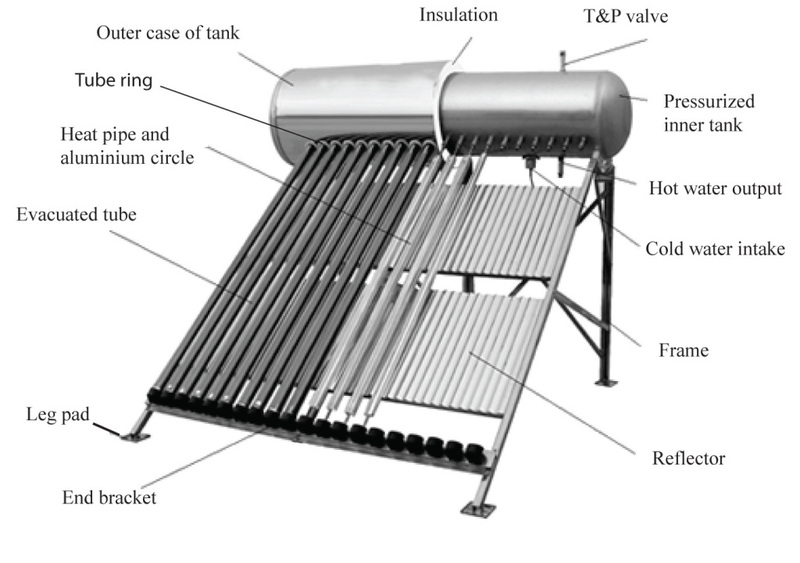 The Pre-Heater Solar Water Heater is the exact same as the Non-Pressurized Solar Water Heater, except it has a copper heat exchanger that pressurized municipal or well water runs through. 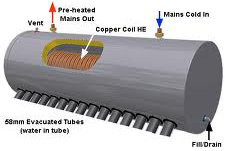 This system is only meant for climates that do not experience freezing weather as there is water in the evacuated tubes and the system is open to the elements. This system can only function as a pre-heater to another system because the water going through the heat exchanger will not necessarily get hot enough for the end point of use.